Happily ever after never seemed so far, far away as when the lovable green ogre (Mike Myers) allows his avocado-colored wife Fiona (Cameron Diaz) to talk him into traveling to her parents' kingdom to have their marriage blessed. 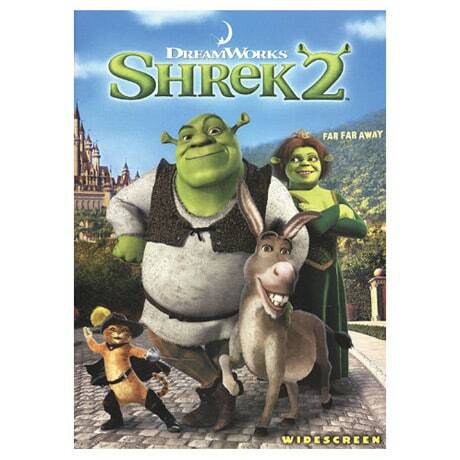 With the help of his faithful steed Donkey (Eddie Murphy), Shrek must take on a potion-brewing Fairy Godmother (Jennifer Saunders), the pompous Prince Charming (Rupert Everett), and the famed ogre-killer Puss in Boots (Antonio Banderas). This 2004 sequel to the Oscar-winning 2001 fairy tale parody was nominated for two Academy Awards: Best Animated Feature and Best Song ("Accidentally in Love"). DVD extras include an all-new surprise ending, making-of featurettes, and games.